The Silver Star Families of America is a non profit/non political 501 c 3 organization. We do not endorse any political candidates and we spend no funds on political or lobbying activities. However we can and do involve ourselves in legislation in regard to the wounded, injured and ill of our armed forces. Also many states and cities have passed legislation in regard to the Silver Star Banner and/or Silver Star Banner Day. The Silver Star Families of America welcomes such legislation but will not engage in lobblying activity, and will strictly abide by the rules and regulations of the Internal Revenue Service. If you have any questions please contact our Legislative affairs officer Steve Newton. If you have further information please let us know. Colorado The United Veterans Association in CO introduced legislation last year. It died. Contact state reps to get this revived. Indiana Passed in July 2011. Iowa Iowa asks the question on drivers license applications. Maine Maine will be issuing ID cards starting on July 18, 2011. Nevada No designation on ID cards, but veterans are exempt from certain taxes and can receive customized plates. New Jersey New Jersey's county departments of veterans affairs are issuing veteran ID cards. Passaic County . New York New York, through Senator Johnson, has introduced legislation to include designation on licenses in 2012. To fill the void, New York's county departments of veterans affairs are issuing veteran ID cards. Dutchess County, Suffolk County Saratoga County and Rome County. Tennessee Passed This Year will go into effect when licenses are redesigned. Chairman Akaka, members of the Senate Committee on Veterans affairs and staff: The Silver Star Families of America are proud to have been asked to submit written testimony to the Committee on Veterans Affairs and we look forward to working with the Committee in the future. The SSFOA was founded in 2004 with one mission: To remember, honor and assist the wounded, ill, injured and dying troops and veterans from all wars. We have remained true to our mission even as we have expanded our membership and programs. The SSFOA Silver Star Service Banner has become the symbol of our wounded, ill and injured. And we are honored that the House and Senate both approved May 1st as Silver Star Service Banner Day; a day forever set aside to remember those who have sacrificed so much for us. Mr. Chairman and members of the Committee: The SSFOA would like to express a few concerns which will set our legislative agenda. 1. While we strongly supported legislation that provided training, insurance and a stipend for caregivers, we were dismayed that the bill provided these benefits only to those of the current conflict. As our veteran population ages it is imperative that this program be expanded to all veterans and their caregivers. It is our opinion that in the long haul, training caregivers will save the Veterans Administration time and money while making sure our veterans receive the care they deserve. 2. We are very concerned about the number of suicides in the military and the quality of the programs designed to combat them. We have received information that the “anti-suicide” training programs are inadequate and provided unevenly. 3. One of our top legislative priorities is to provide every new military recruit with an MRI scan. We strongly believe that having a base scan will provide information that can later be used to identify changes in the brain and will facilitate treatment and improve the claims procedure for those wounded by PTS or TBI. 4. We are continuing to monitor the Veterans Administration's contracts with outside organizations using V.A. land. An example is the situation in Los Angeles where many acres of V.A. property have been contracted out. Our concern is that veterans that are patients have not always had access to the facilities that sit on V.A. land. 5. We continue to receive requests for financial aid from veterans just separated who have not yet received their benefits (some have been waiting 1-2 years). It is our suggestion that all DoD claims and V.A. claims older than 6 months receive an automatic temporary approval. 6. Smoking: While the SSFOA does not condone the practice we never again want to see an old veteran, who was probably encouraged by his government at the time of his service to smoke, hiding behind a pillar in a wheelchair in the freezing cold fearing he would get a ticket from the V.A. police. This is not acceptable and is not required for certification. Smoking areas should always be provided. 7. Our Advisory Board has recommended that all returning veterans, and their families, be given information on what to look out for in regard to PTS, TBI and any other problems that they may encounter after a deployment. 8. They are also concerned that the V.A. will not be able to provide the same standard of service they now provide, with the huge influx of new veterans and suggest the continued expansion of fiscal resources. 9. After a survey we are recommending that the long standing practice of not issuing a Presidential letter of condolence to the families of suicide victims be revised. If the suicide was the result of being wounded by Post Traumatic Stress that occurred in a war zone we advise issuing a condolence letter. We are also asking that the Committee consider making such a suicide a “line of duty” death. 10. We are concerned that all soldiers given medication in the field are monitored and the dispersal of the medication be recorded in their health records. 11. While the SSFOA has not taken a position on homosexuals in the military, we strongly advocate that any one segment of the military population not be given any special treatment. Same rules and regulations of each branch of service for ALL in that branch must apply. The inclusion of any individual in the military must not be at the detriment of that force's effectiveness, cohesiveness and military readiness. We would also recommend that passage of any legislation be delayed until the completion of the DoD’s study. 12. We recommend moving the official observance of Memorial Day back to its traditional May 30th date. The SSFOA will continue to remember, honor and assist the wounded, ill, injured and dying of our armed forces and we will be pursuing these issues in our legislative agenda. We request that this testimony be read into the Congressional Record. A special thank you to the members of the SSFOA and our friends at the FR for their input. I thank the Chairman and the Committee for this opportunity and I ask that God bless you in all your endeavors and that He continue to bless the United States. United States House of Representatives Recognize the Silver Star Service Banner and Declare May 1 Silver Star Service Banner Day. Expressing support for designation of May 1 as `Silver Star Service Banner Day'. Resolved, That the House of Representatives supports the designation of `Silver Star Service Banner Day' and calls upon the people of the United States to observe the day with appropriate programs, ceremonies, and activities. Designating May 1 each year as `Silver Star Banner Day'. 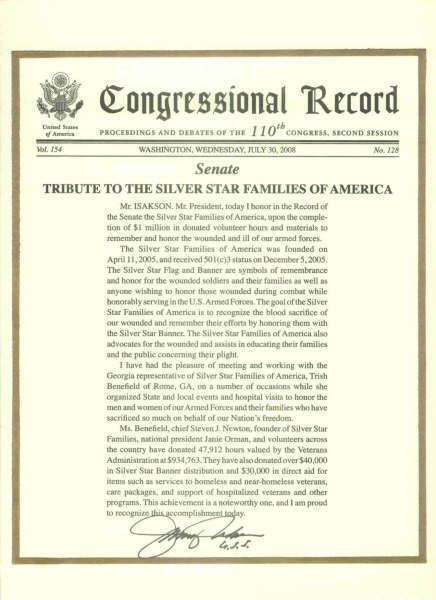 Resolved, That the President is authorized and requested to issue a proclamation designating May 1 each year as `Silver Star Service Banner Day' and to call upon the people of the United States to observe the day with appropriate programs, ceremonies, and activities. The group, founded in 2005, has presented hundreds of Silver Star banners to wounded servicemembers and their families. The banners, which the group is working to make a government-recognized service banner, like those of the Gold Star Mothers, serve as a reminder to everyone who sees them of individuals’ sacrifices. Alabama State Rep. Greg Wren said he introduced the legislation to ensure that the “blood sacrifice of those who were wounded while wearing the uniform of the United States” is recognized. His efforts paid off with unanimous approval in both the state’s house and senate. Wren also had a personal reason for working to have May 1 declared as Silver Star Day in Alabama. His family has a long history of military service, including his father, retired Air Force Chief Master Sgt. James Wren, he said. DESIGNATING SILVER STAR DAY IN THE STATE OF ALABAMA ON MAY 1, 2007. BE IT RESOLVED BY THE HOUSE OF REPRESENTATIVES OF THE STATE OF ALABAMA, That special commendation and tribute are herein extended to wounded veterans of the United States Armed Forces and, by copy of this resolution for appropriate display, we recognize this momentous Silver Star Day in the State of Alabama on May 1, 2007. On Tuesday, the Senate praised the Silver Star Families of America with the passage of Senate Resolution 29, for their efforts in honoring those who have been injured or wounded in the defense of their country. Silver Star Families is a not-for-profit, all volunteer organization founded for the purpose of establishing a Service Flag to honor wounded military men and women. The organization also provides assistance and support to these soldiers and their families. The resolution also designates May 1, 2007, as “Silver Star Day” in Oklahoma in recognition of the wounded military personnel of this state. transmit a duly certified copy of this resolution to the Silver Star Families of America Organization. who have been wounded or disabled. Approved 8-0 in House Committee on Counties, Municipalities and Military Affairs. The Silver Star Families of America is a non-partisan, not-for-profit charitable organization committed to supporting the United States Wounded Military Members and Veterans from all wars, past and present, and honoring their sacrifice with Silver Star Banners.Content within this web site is the sole property of The Silver Star Families of America"All photos and letters sent to the SSFOA become the property of the organization to be used in any way we deem appropriate." SSFOA reserves the right to conduct the day to day business of the organization as they deem appropriate.